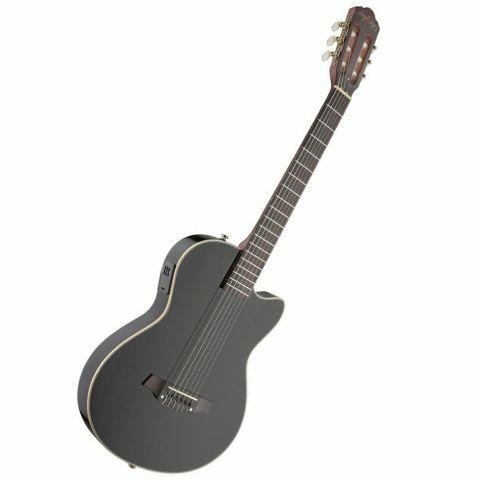 The Angel Lopez Electro Classical Guitar, Black is a Full-Size 6-String Thin Bodied Electro Classical Guitar with a Solid Body and Black Finish. The Angel Lopez Electro Classical Guitar features a single cutaway body. The guitar's top is spruce veneer and the back and sides are made from solid spruce. The Guitar also features a Mahogany neck and headstock topped with a Rosewood fingerboard and bridge. It also features an Active AR300 Electronics and 2-band EQ + volume control + Battery indicator LED. Finish: matt neck/high glossy body.